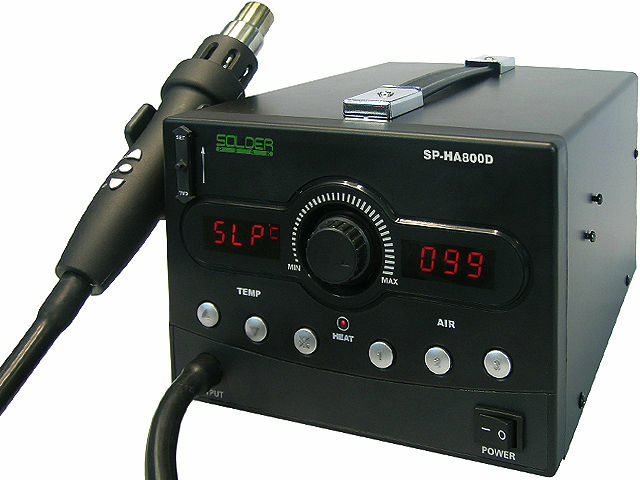 Hot air SP-HA800D digital soldering station thanks to the use of a high power heating element and microprocessor’s control is widely used in laboratories, services and in production. High accuracy of temperature and air-flow setting make it a perfect solution for soldering and desoldering even most sensitive SMD elements. Additional advantage of this station is possibility to control parameters by means of push buttons located on a hot air handle. possibility of working in a lead – free technology. automatic heating element cooling function.